Microsoft made an announcement earlier today that the final version of Internet Explorer 8 will be released today at noon EDT. The web browser can be downloaded from that time on from the official Internet Explorer 8 website where it is provided in 25 language editions and for various Windows operating system versions (including server versions of Windows). Currently, only the download of Internet Explorer 8 RC1 is offered on that homepage which might confuse a few early birds. Update: It is live now. Internet Explorer 8 is Microsoft's attempt at winning back market share from popular web browsers, and especially Mozilla Firefox. Microsoft has added several new and improved security features to Internet Explorer 8 like private browsing mode, automatic crash recovery, domain highlighting or Cross Site Scripting (XSS) and SmartScreen filters. There are also additional usability features like Accelerators or Web Slices which have been implemented into Internet Explorer 8. Most of these features have already been ported by Firefox users to the Firefox web browser, and are not super new anymore. Smart Address Bar - matches what is typed with the history and favorites. Tab Groups --related tabs are grouped next to each other, and highlighted. Redesigned New Tab Page -- New Tab page has been redesigned. Find on Page with result count and highlighting. Internet Explorer Administration Kit improvements. Web Development Enhancements: CSS 2.1, DOM and HTML 4.01 improvements, Emerging standards, Acid 2 100%, better compatibility, developer tools, and more. Accelerators -- access features of online services on all pages. Web Slices -- access information from any page you are on. Instant Search Box -- real-time suggestions when users type in the search box. Compatibility View to view web pages designed for older browsers. Compatibility View list -- A list of sites and pages best viewed in compatibility view. Companies with strict security guidelines (that do not allow the installation of Firefox or Firefox add-ons) will increase the security and stability of their computer systems with the new browser. Most performance tests on the other hand see Internet Explorer 8 at the end of the list. Internet Explorer 8 does however provide major performance improvements over previous versions of the web browser like Internet Explorer 7 or 6. There are no information available at this point if Microsoft will add Internet Explorer 8 to Windows or Microsoft Update and provide the web browser as an automatic update to Windows users. Update: You find all Internet Explorer 8 downloads for Windows XP, Vista and the server operating systems on our IE8 download page. Just check it out to download the version most suitable for your operating system. Keep in mind that it has been released as a 32-bit and 64-bit version, and that Windows Vista users should consider downloading Internet Explorer 9 instead which is also available for their operating system, and Windows 7 users should consider installing Internet Explorer 11, the latest release version of the web browser. Microsoft released Internet Explorer 8 final for all supported client and server operating systems, and we have the list of new features for you. I use IE for MS updates, period. I had switched from IE6 to IE7 for enhanced security as to what I had read and been told. 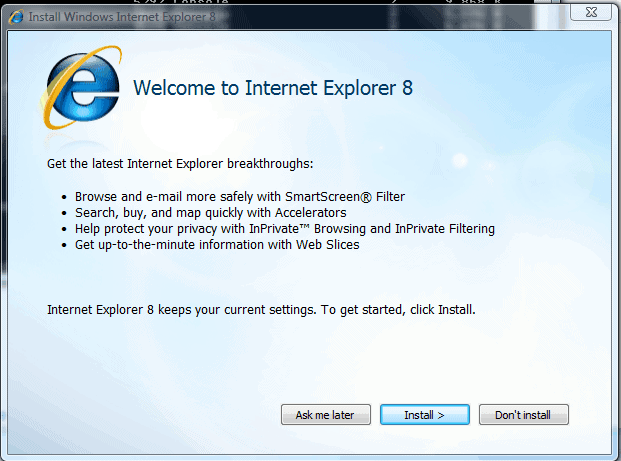 Who could tell me if IE8, besides its gadgets, is an improvement in terms of security (IE engine, not privacy gadgets)? Thanks in advance. Winning back a market when still being the poorest css and dom implementation of all major browsers? And of course no implementation of some wanted html5 features like canvas. Allow me to doubt a lot about their success. People are now aware again of the existence of alternatives, and this time Microsoft won’t be able to kill them like he killed Netscape. Brian, it happens often, any additional installation including Firefox. And not always because anybody thinks Firefox is bad, just installations in general. RG is right with his explanation. Corrected the mistake. IE8 is already available for download. Oh, I’m well aware of “managed desktop” policies. Ugh. I just think that a security policy that requires you to use MSIE exclusively cannot be considered safe (albeit, “strict”). Regardless, I look forward to giving this 8.0 version a workout (at home, of course). I’ve dl’ed and updated to IE8. Went straight to one particular blog that was mauled beyond recognition during the beta. All’s well, even with compatibility disabled. Still, there are nagging web standards issues (it doesn’t render the headings on that site the way Firefox does…IE8 makes the headings HUGE, but so did IE7). Other than that, it’s a nice improvement. Now, if they could ever figure out that users want SPEEEEEEEEEEEEEEEED. Internet Explorer 8 is still sluggish compared to the Flaming Canine.